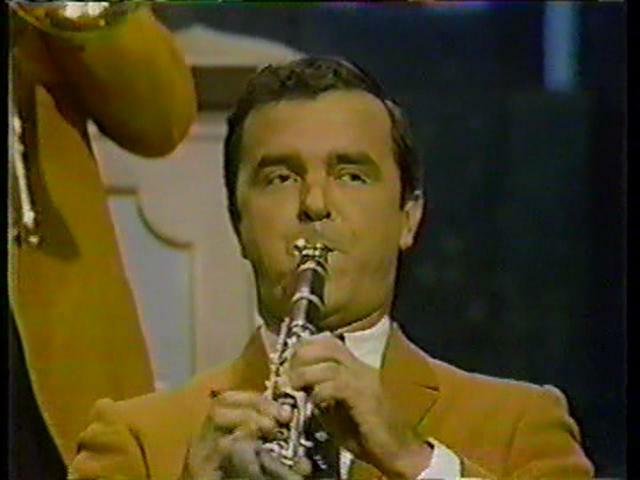 Mahlon Clark, born March 7, 1923 in Portsmouth VA, played clarinet, saxophone and flute with the Lawrence Welk Show from 1962 to 1968. Clark was a versatile clarinet musician who worked with a number of notable jazz artists for many years. Clark moved out to Los Angeles with his first wife, big band vocalist Imogene Lynn in 1942, whom he met while playing with the Ray McKinley band. He worked with other bands including Dean Hudson, Will Bradley, Tex Beneke and Bob Crosby prior to joining the Welk Orchestra. Mahlon joined the Lawrence Welk Show in 1962 to fill the big shoes left when Pete Fountain and Al Hirt departed in 1959. He played in the reed section until his departure in 1968, and went on to perform with other notable and diverse artists such as Ella Fitzgerald, Madonna, Frank Sinatra and Elvis Presley. While on the show, he married another fellow Lawrence Welk Show performer, Kathy Lennon. They were married from 1967 to 1979. Clark was replaced on the show by another famous Welk Show clarinetist and Louis Armstrong alumni, Peanuts Hucko. Clarke passed away from natural causes on September 20, 2007 at his home in Van Nuys, CA at the age of 84.